The Flow-Cytometry Facility is located on the Nineth floor, East wing of the Hunter North building. This Facility can provide analyses of up to 7 parameters in eukaryotic cell populations and sort cells under sterile conditions. These analyses can be used to identify and isolate rare cell populations, determine chromosome ploidy in individual cells, study apoptosis, and study cell-signaling, among other applications. User training for the FACSCalibur(Becton-Dickinson Biosciences) and assistance in its operation is available, by appointment, through the Facility's Manager. Periodic user training on the FACSCalibur is also provided through specialized seminars. The FACSVantage(Becton-Dickinson Biosciences) is operated only by the Facility Manager. The Manager and Project Director are available to discuss projects and to advise investigators on the applications relevant to their project. 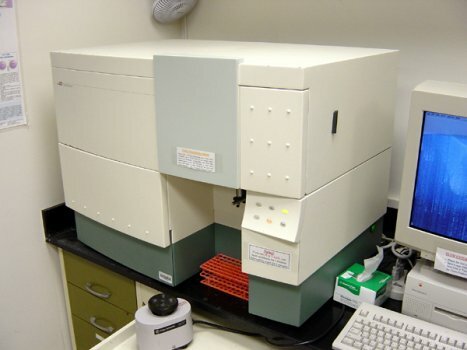 FACSCalibur is a bench top analyzer consisting of Argon, air-cooled laser emitting at 488 nm and 633 nm diode laser. It can provide analyses up to 6 parameters and up to 4-colors. FACSVantage is a sorter consisting of Helium-Neon (HeNe) air-cooled laser emitting at 633 nm and an Enterprise II, water-cooled laser emitting at both 488 nm and Ultra Violet(UV). It can provide analyses up to 7 parameters and up to 5-colors. 1. Make an appointment to use the equipment at least one week in advance. 2. 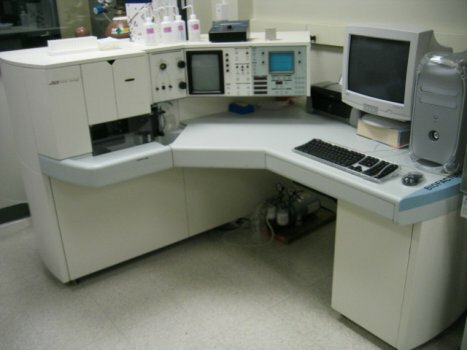 Equipment use is limited to a 2-hour period per laboratory per day unless special arrangements are authorized. Users must notify the Facility of any cancellation at least 6 hours in advance. For the FACSVantage, a set-up fee will be charged for a missed appointment. 3. Sign the log Book that is placed adjacent to all instruments. 4. After each session on the FACSCalibur, follow the instrument cleaning procedure. 5. The Principal Investigator of each lab will be responsible for his/her laboratory personnel. 6. Report any problems to the manager as soon as possible. a. FACSCaliubr is equipped with Air-cooled Argon laser emitting at 488 nm and a Diode laser emitting at 633 nm. Although the lasers are enclosed, the light may be visible (with difficulty) if the cover is opened. Do not look at the laser light. It can damage your eyes. b. FACSVantage is equipped with Enterprise and HeNe water-cooled lasers, which are visible when the instrument is in operation. No one is allowed in the room without the presence of the Facility Manager while the instrument is in operation. 2. Specimens: Depending on the investigator's specimens, one needs to wear an appropriate protective clothing (latex gloves, lab coats, face shield etc.). No materials requiring BL2 should be brought to the Facility. Latex gloves should be used when changing fluids in the FACSCalibur. There is an additional set-up fee of $20.00 for sterile sort.